Timeline preview rendering is an outstanding feature of Kdenlive. It officially debuted in version 16.08. Preview rendering allows you to render parts or your complete timeline in the background, so you can smoothly play it back. This is especially useful when you work with complex track compositions or use effects that are computationally intensive. Instead of stuttering playback, you now get smooth playback. This way, you can check that your timing of keyframes and effect is working out nicely. 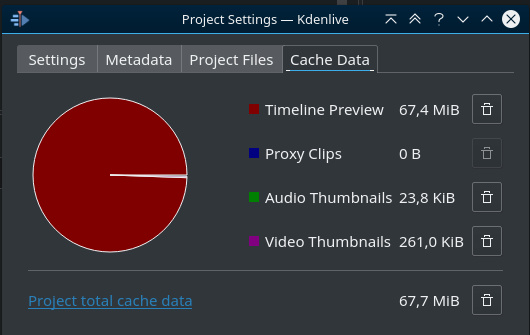 And you don’t need to leave Kdenlive, as you would need when rendering your timeline to an traditional video file. Raw source footage: a good example for Kdenlive’s new timeline preview rendering is this: say, you have some FullHD source footage. Raw, your system easily plays this clip back at its original frame rate of 25fps. This isn’t even a job for proxy clips on a decent system. Now let’s get effects-heavy. For production, we need to de-fish this footage (action cams, you know). After defishing, we need some sharpening. And then, we also have to decompress the tonal curve (Protune, y’know). Wait, there’s more: saturation needs to be corrected too (again, Protune). With these innocent four effects applied, look at the playback rate that’s shown in the bottom right corner of the monitor: dismal six frames per second! It crawls. Unfortuntely, proxy clips don’t help in this situation: proxy clips are low-res and low-quality variants of the source clips, without any effects applied. So our effects will slown down also proxy clips considerably. You need timeline preview rendering. Please note: timeline preview rendering does not speed up timeline editing. It speeds up the timeline playback. Why should you need that? For instance, to check the correct timing of keyframed effects and transitions. Preview rendering solely covers rendering the video part of the timeline. In contrast, Kdenlive renders audio always independent of the preview rendering. In particular, you can make audio changes at any time without affecting preview rendering. Set the timeline zone in (I) and out (O) points for the zone you want to render for preview. Next, select Add Preview Zone (alternatively, Timeline > Timeline Preview > Add Preview Zone). Please note: for the first time, you won’t see any change yet. Select Start Preview Render (Timeline > Timeline Preview > Start Preview Render). Or press Shift+Return. Note: you can even add multiple, non-continous preview rendering zones. A red bar appears (if it has not already been show): it’s located right between the timeline ruler and the topmost track. As background rendering progresses, this bar will slowly turn green, chunk by chunk. preview zones turn back to red. Simply restart rendering, if you need. Step 3: Enjoy Smooth Timeline Preview! All green chunks of your timeline will now play back at full speed. You should immediately notice that scrubbing such timeline zones will be much faster too. Timeline playback is now full 25fps, even as the corresponding timeline clip makes heave use of effects (especially de-fish is computational intensive). Kdenlive is smart enough to support some levels of undo and redo. So you can check out the results of a two different effect settings by quickly undoing and redoing the effect change without having to render anew the preview. You can easily find out how much storage you are currently using for the timeline preview. Use Project > Project Settings, then select the tab Cache Data. You’ll now see a neat figure illustration cache data diskspace consumption. At any time, you can quickly remove the cache data used for the timeline preview: simply click on the trash button next to row Timeline Preview. Most of the time, it should suffice to leave the preview profile set to Auto. Kdenlive then will select a suitable preview profile based on your project profile. 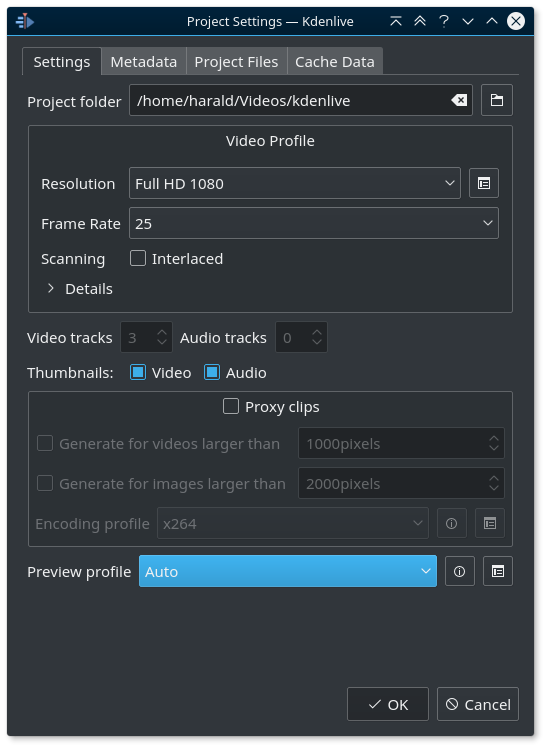 In some rare cases, as with unusual frame rates, or when you want to control the preview rendering encoding quality, then you can change the preview profile, or create your own preview profile. Use the Manage timeline preview profiles button next to the preview profile selection. 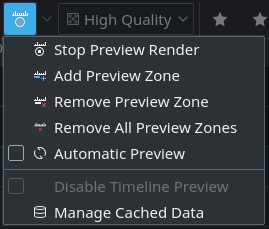 If for some reason the rendered preview should get out of sync with your timeline editing, simply remove the corresponding preview zone (Remove Preview Zone) or all preview zones (Remove All Preview Zones). This gets you back to a sane preview state. Then add the zone back again (using Add Preview Zone), and rerender. Please use the forum or g+ community for help and/or file a bug report if needed. Is it possible auto-add and auto render transictional effects? Auto rendering is possible using timeline preview, we’ve a toolbox article on this feature. This works by rendering parts of the timeline, so not on a single transition. As for auto adding transitions I think there’s an option in the settings for it, but I cannot remember clearly; I’ve never used it, as it would make my editing work a headache by throwing in transitions on all clips … if that is what you are asking for. Please check the settings for timeline details, if I’m not mistaken. Kdenlive General Discussion :: ENV threads in the refactoring? Revert "Trying to submit changes through HTTPS"